Travel to Vietnam is often associated with a backpacking vibe. But there’s also plenty of stylish, gourmet eating options if that’s what you’re into. That’s especially so in Ho Chi Minh City (or HCMC, or Saigon, as it’s also affectionately known) – which overall has a more modern, business feel than the capital Hanoi. The restaurant Noir. 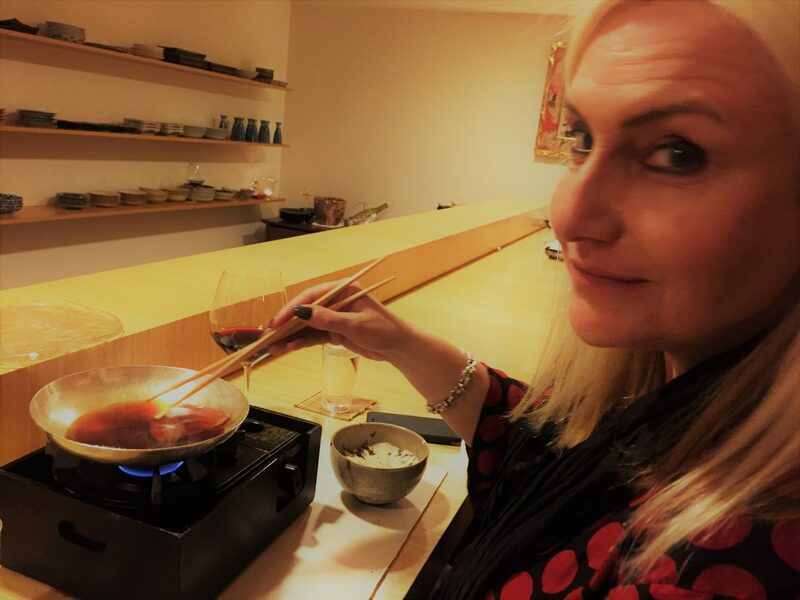 Dining in the Dark is one of my top recommendations for treating yourself to a luxurious – and in this case, highly unusual! – quality dining experience while you’re in HCMC. Have you ever eaten an undisclosed three course meal completely in the dark and had to say what it is? If not, then read on to find out what it feels like! Noir. Dining in the Dark: What makes it special? Noir. Dining in the Dark serves thoughtful and excellent quality food. But that’s absolutely not its unique selling point! What makes it really special is that you eat in a completely pitch-black dining room where you’re served by blind/visually impaired waiters! You don’t know in advance what your food will be – other than in headline terms that it will be a meal which is either eastern-influenced, European-influenced, or vegetarian, depending on which you’ve opted for. (And you also know it won’t contain anything you’re allergic to or actively dislike, as that’s established very particularly in advance). This means that the dining experience involves trying to work out what are the many different foods that make up each course, through the senses of smell, taste and touch – all of which are heightened by your lack of sight. The experience challenges you to appreciate better both the food in front of you, and what it means to be sightless. And without the crutch of your mobile phone, placed in a locker outside the dining room, you need to rediscover the art of conversation too! The dining in the dark concept features in many cities across the world. I’d already been to the unsicht-Bar in Berlin, Germany. But that had been at least 10 years previously, and I had only vague memories. So I was keen to find out how it was done by Dutch owner/manager Germ and his team in Vietnam, and what personally I would make of it all now. Noir’s sister restaurant on the same site is Blanc. Here, instead of your waiting staff being blind/visually impaired, they are deaf/hearing impaired. So you can see what you’re eating, but you have to communicate with the waiters through signing to order it. I’ve definitely got the Blanc experience on my list for whenever I’m next in HCMC. But on arrival at the restaurant, it was actually deaf staff who greeted us at the door, which threw me momentarily because I wasn’t expecting it, even though I knew what sort of restaurant we were coming to. My dining companion, meanwhile, had no idea what was going on, as I’d arranged it as a surprise. But a little gesturing later and we were in! One other really excellent thing about Noir. and Blanc. that makes them special is that they specifically recruit and train people with disabilities, who might otherwise in Vietnam be overlooked for employment elsewhere. You can read more about that here. Noir.’s lounge area & bar where you’re received for pre-dining drinks, plus a final chat with staff to check that all your allergy needs have been catered for in the surprise menu that you’re about to eat in the dark! This large and strange relative of the lemon – adding some appropriately tactile Asian style to the decor in the lounge area at Noir. – is called a Buddha’s Hand! At the end of the meal in the lounge area, a member of Noir.’s staff takes you through pictures of what you’ve been eating on an iPad, to see if you got it right! This is a supremely interesting one, because ambience is usually made up of a combination of factors, many of which – such as decor, lighting and fellow diners – have a large visual element, but none of which you can see in Noir.’s dining room! Before entering the dining room you’re give an acclimatization exercise for having to feel your way around the dining table in the pitch black. Blindfolded in the lounge area, you must complete a child’s puzzle of fitting different shapes into the correct holes on a wooden board. It looks super easy, but blindfolded, it’s much harder than it looks! I’m still at it – no that one doesn’t go there! Finally complete and I’ve earned my dinner – harder blindfolded than it looks! After the preliminaries in the lounge area, you’re introduced to your waiter who leads you through into the dining room in a line formation. To do this, my hand is on his shoulder and my dining companion’s is on mine. Once in the complete darkness, when we had to turn a corner, then our waiter warned us in advance. Walking into the complete darkness was quite a shock as there is absolutely no chink of light whatsoever. It makes you realise that, for the sighted, absolute pitch black darkness is a very rare experience indeed. Our waiter helped us to our seats and oriented us around the table by talking us through where our wine glasses, napkins and cutlery were. That led us to feel around with our hands and make a mental map of the layout of our table. Based on the lack of background noise, it felt like there weren’t many other people in the dining room, but we couldn’t be sure. I thought there was perhaps one other table of diners in, but the dark seems to make you want to whisper, so maybe the others were just talking quietly? A crash, accompanied by light laughter – which seemed to come from a table behind me to my left, but who knows? – suggested that someone had missed the edge of the dining table when replacing their wine glass! When the food arrives, you find yourself naturally using your hands, aswell as your cutlery, to pick it up and try to determine what it is. It is all tremendous fun and a profoundly awakening experience! For obvious reasons, I have no photos of the food served at Noir.! You specify in advance whether you want a meal that is ‘From the East’, ‘From the West’ (European), or vegetarian. And as I said above, the staff at Noir. are very careful in advance to double-check that they’ve established any food allergies and strong food dislikes before you go in to dine. It’s really much more fun, and a more meaningful experience, if you and your dining companions opt for the same menu – as that means you can talk about what’s in front of you (rediscovering the art of conversation again! ), and compare notes on what you think all the various things are! And it should be said that the menu includes sometimes unusual ingredients and has complex garnishes, which all adds to the challenge and the fun! You know there’ll be a starter, main course, and dessert. Beyond that, you don’t know what specifically you’ll be eating. Personally, I was delighted for it all to be an exciting surprise on the night! But if you prefer, you can look at the menus from previous seasons on Noir.’s website to give you some idea of what it might be. So only semi-spoilers here, since what I’m about to describe is not the current menu, and the past two year’s seasonal menus given on their website have been really quite diverse. But scroll past the next three paragraphs if you wish to turn up with absolutely no idea! For those who do want an idea though, then the menu From the East might include a starter of edamame soup finished with chicken jerky, shisho leaf and chilli oil; a main course of slow-roasted flat beef finished with grilled pineapple fish sauce, taro chip, Vietnamese basil and preserved celery; and a dessert of banh la dau xanh (a traditional ‘moon cake’ of layers of mung bean and pandan leaf mousse) with pineapple jam. Good luck with identifying all that lot in the dark, haha! A menu From the West might start with a Bouillabaisse Consommé; move on to a pan-fried half-cured salmon fillet with glazed apple and cognac-ham butter; and finish with a trio of desserts, including a honey ginger pannacotta sitting atop blackberry soup, in turn topped with a white chocolate crunch. And a vegetarian menu could comprise a vegetable tartare finished with crunchy dried wakamae, Vietnamese basil and peanut dressing; followed by a savoury tofu cake and caramalised coconut sauce; and then a dessert that includes preserved calamansi ice cream. Drinks to accompany the meal are discussed in the lounge before you are led into the dining room. Wine pairing with the three courses is also an option, which gives you the added challenge of trying to determine which grape variety you’re drinking, and which country it’s from. We certainly didn’t get them all spot-on, but I was pleased with myself at least to have determined that the wine with dessert was a sparkling red! And how did we do on knowing what we were eating? I reckon we got only about 60% of it right, based on the flavours, and also the textures and smell of the food, a sense of which is also heightened in a sightless environment. Service was efficient and there wasn’t a long wait between courses. Overall, Germ and his team of blind and partially-sighted waiting staff were excellent and attentive throughout. That was not only in carefully and patiently explaining the format of everything to do with our very unusual dining experience as we went along, but also – in collusion with me – in arranging surprise birthday extras of flowers and a beautiful cake for my dining companion, to be enjoyed in the lounge. And to top it all, the team of deaf/hearing impaired staff from Blanc. signed the Happy Birthday song! – video below. So all-in-all it was a very special and memorable dining experience indeed! Most visitors to HCMC stay in District 1. Noir. Dining in the Dark is also located there, but it’s a bit off-downtown, and down what is more like an alley than a side street, so chances are you’ll need to get a cab (and it helps to know that it’s on the left at the end of the lane next to the bread shop!). Noir. are then happy to arrange a cab back for you at the end of your meal. Posted on 18 January 2018 22 July 2018 By Santé Bon ViveurPosted in Foodie Travel, VietnamTagged Gourmet Eating, Ho Chi Minh City, Restaurant review, Saigon.